A considerable lineout presence and a back-row with bags of pace, Wood forged an impressive reputation with Worcester and Northampton before graduating to Test honours with England. A product of the Worcester academy, a teenage Wood furthered his rugby education with a spell with North Otago in New Zealand before returning to Sixways. 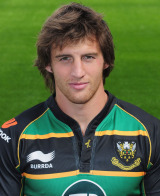 A switch to Northampton followed in 2010 which coincided with his call-up to the England Saxons. A year later he made his full international debut against Wales. He played in all five games as England clinched the Six Nations title, but not Grand Slam, and later the same year was named the Aviva Premiership's Player of the Season. Wood was a compelling option for an England pack lacking speed off the mark but he failed to hold down his place during England's dismal Rugby World Cup campaign in New Zealand. As England embarked on a new era under Stuart Lancaster, he was touted by many as a likely captain but a toe injury ruled him out of the 2012 Six Nations and limited him to just five Premiership appearances. His injury confounded medics and he decided to rule himself out of that summer's tour to South Africa to work on his fitness. He battled back to form and fitness the following season and featured strongly in England's victory over world champions New Zealand and in their Six Nations campaign while also helping propel Northampton to the Premiership final. His efforts were rewarded with the England captaincy for their tour of South America when regular skipper Chris Robshaw was rested.